The car backseat organizer in Mélange Pink from the LASSIG About Friends collection can be easily attached to the backside of a car seat. 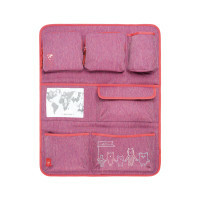 Product information "Car Wrap-to-Go, About Friends Mélange Pink"
description & equipment The car organizer from the Lassig About Friends collection is practical and sustainable at the same time. It can be easily attached to the backside of a car seat so that children have everything within easy reach while on the road. 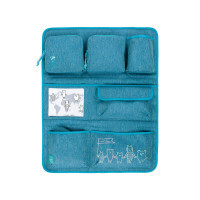 Whether it's a toy, plush animal, snacks or beverages, there's enough space for everything in one of the several zipper or Velcro compartments to keep everyone happy. 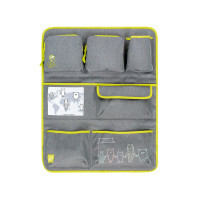 Available in three colors, this convenient travel accessory therefore caters perfectly to the needs of children and assures a smooth and quiet trip for parents at the same time. The material used in the sustainable accessory is partially made of recycled polyester. The Repreve® certificate guarantees that the materials are made from used, recycled PET bottles. This process is resource-saving as well as very energy-saving. For this car wrap-to-go, 2 PET bottles were recycled.